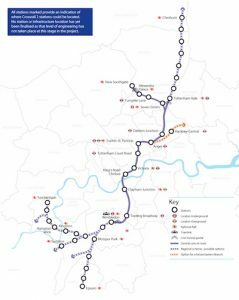 Crossrail 2 is a £27.5 billion project to connect existing rail routes in south-west and north-east London with a 36 kilometres central section of twin tunnels that will link Wimbledon and Tottenham Hale/New Southgate. A number of intermediate stations will be provided at Tooting Broadway, Clapham Junction, King’s Road Chelsea, Victoria, Tottenham Court Road, Euston St Pancras to provide HS2 connectivity, and Angel. The aim is to enhance rail capacity to meet the transport needs of a growing London population which is expected to increase by 20% to reach 10 million people by 2030 and require new areas for the development of housing. Initial planning work has started with the publication of a draft safeguarding document that alerts householders, businesses and developers to the proposals and the effect there might be on adjacent property. This is a formal process, undertaken by the Department for Transport, to protect land required for major new infrastructure projects from future development that instructs local planning authorities to consult Transport for London on planning applications for land within the relevant area. This includes the possible route of the tunnels as well as ground level requirements for the construction of tunnels, stations and ventilation & emergency access shafts. The Crossrail 2 route partly replaces the existing safeguarded alignment of an earlier proposal for a new London Underground line from Wimbledon to Leytonstone, known as the “Chelsea-Hackney line.” This route is currently protected by a statutory Safeguarding Direction, which has not been refreshed since 2008. This will now to be updated to reflect current plans once a consultation process has been completed with the aim of issuing a revised instruction in March 2015. Two options are being considered for the future services one based on a Metro approach that restricts operations to the line itself or a more ambitious scheme that would see the projection of services to destinations served on the South West, Great Northern, and West Anglia main lines. The latter option has been identified by Network Rail as a long term solution to capacity constraints at the London Waterloo terminus with shorter distance services diverted to the new infrastructure to accommodate the expected growth in longer distance commuters on the route. Currently the plan is that trains would reach Twickenham, Shepperton, Hampton Court, Chessington South and Epsom. The Government has set an objective of restricting central Government grant to 50% of the cost but the London Mayor believes that a combination of fare box revenue, business rates and taxation raised from developers will be sufficient to fund the remaining investment. FCP has been successful in its response to the need for expertise to model the various options for project delivery to enable services to start in 2030.